Galera Cluster is a synchronous multi-master replication plugin for InnoDB or XtraDB storage engine. It offers a number of outstanding features that standard MySQL replication doesn’t - read-write to any cluster node, automatic membership control, automatic node joining, parallel replication on row-level, and still keeping the native look and feel of a MySQL server. This plug-in is open-source and developed by Codership as a patch for standard MySQL. Percona and MariaDB leverage the Galera library in Percona XtraDB Cluster (PXC) and MariaDB Server (MariaDB Galera Cluster for pre 10.1) respectively. We often get the question - which version of Galera should I use? Percona? MariaDB? Codership? This is not an easy one, since they all use the same Galera plugin that is developed by Codership. Nevertheless, let’s give it a try. In this blog post, we’ll compare the three vendors and their Galera Cluster releases. We will be using the latest stable version of each vendor available at the time of writing - Galera Cluster for MySQL 5.7.18, Percona XtraDB Cluster 5.7.18 and MariaDB 10.2.7 where all are shipped with InnoDB storage engine 5.7.18. A database vendor who wish to leverage Galera Cluster technology would need to incorporate the WriteSet Replication (wsrep) API patch into its server codebase. This will allow the Galera plugin to work as a wsrep provider, to communicate and replicate transactions (writesets in Galera terms) via a group communication protocol. Codership releases the wsrep-patched version of Oracle’s MySQL. MySQL has already released MySQL 5.7 as General Availability (GA) since October 2015. However the first beta wsrep-patched for MySQL was released a year later around October 2016, then became GA in January 2017. 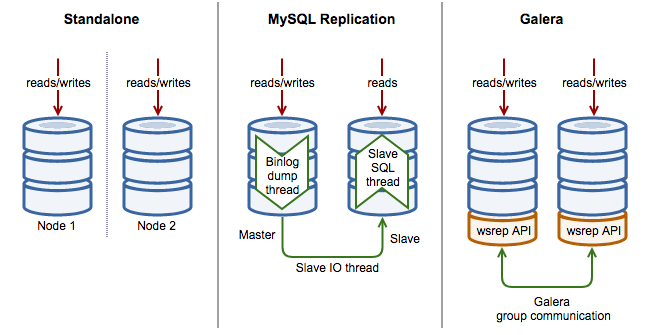 It took more than a year to incorporate Galera Cluster into Oracle’s MySQL 5.7 release line. Percona releases the wsrep-patched version of its Percona Server for MySQL called Percona XtraDB Cluster (PXC). Percona Server for MySQL comes with XtraDB storage engine (a drop-in replacement of InnoDB) and follows the upstream Oracle MySQL releases very closely (including all the bug fixes in it) with some additional features like MyRocks storage engine, TokuDB as well as Percona’s own bug fixes. In a way, you can think of it as an improved version of Oracle’s MySQL, embedded with Galera technology. MariaDB releases the wsrep-patched version of its MariaDB Server, and it’s already embedded since MariaDB 10.1, where you don’t have to install separate packages for Galera. 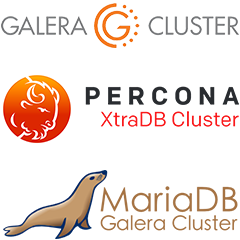 In the previous versions (5.5 and 10.0 particularly), the Galera variant’s of MariaDB is called MariaDB Galera Cluster (MGC) with separate builds. MariaDB has its own path of releases and versioning and does not follow any upstream like Percona does. The MariaDB server functionality has started diverging from MySQL, so it might not be as straightforward a replacement for MySQL. It still comes with a bunch of great features and performance improvements though. The above does not necessarily tell us that PXC is superior to the others. It means that you can get better insights with more statuses. Note that if you do not enable this option, the server will act as a standard MariaDB installation. For Codership and Percona, this option is enabled by default. The above list might change once the vendor releases a new version. The only point that we would like to highlight here is, do not expect that Galera nodes hold the same set of configuration parameters across all variants. Some configuration variables were introduced by a vendor to specifically complement and improve the database server. Database performance is not easily comparable, as it can vary a lot depending on the workloads. For general workloads, the replication performance are fairly similar across all variants. Under some specific workloads, it could be different. Looking at the latest claims, Percona did an amazing job improving IST performance up to 4x as well as the commit operation. MariaDB also contributes a number of useful features for example WSREP_INFO plugin. On the other hand, Codership is focusing more on core Galera issues issues, including bug fixing and new features. Galera 4.0 has features like intelligent donor selection, huge transaction support, and non-blocking DDL. The introduction of Percona Xtrabackup (a.k.a xtrabackup) as part of Galera’s SST has improved the SST performance significantly. The syncing process becomes faster and non-blocking to the donor. MariaDB then came up with its own xtrabackup fork called MariaDB Backup (mariabackup) which supported by Galera’s SST method through variable wsrep_sst_method=mariabackup. It also supports installation on Microsoft Windows. Each vendor provides commercial support services. We hope that this comparison gives you a clearer picture and helps you determine which vendor that better suits your need. They all use pretty much the same wsrep libraries, the differences would be mainly on the server side - for instance, if you want to leverage some specific features in MariaDB or Percona Server. You might want to check out this blog that compares the different servers (Oracle MySQL, MariaDB and Percona Server). ClusterControl supports all of the three vendors, so you can easily deploy different clusters and compare them yourself with your own workload, on your own hardware. Do give it a try.